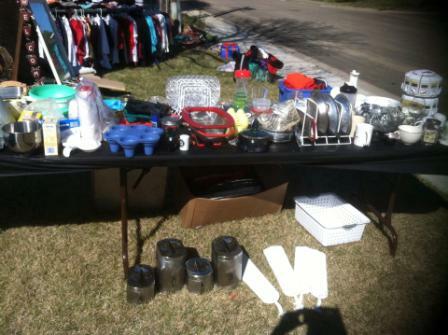 17 tips on how to have the best yard sale ever! Want to throw the best yard sale ever? You’ve come to the right place! 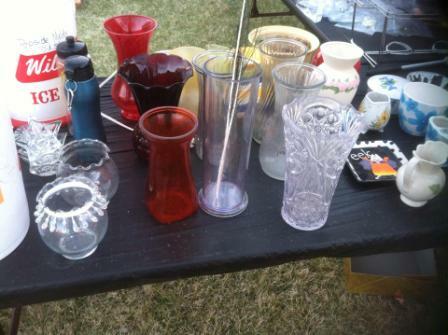 We have 17 tips from experienced yard sale throwers on how to have the best yard sale ever! Who doesn’t love an awesome yard sale? 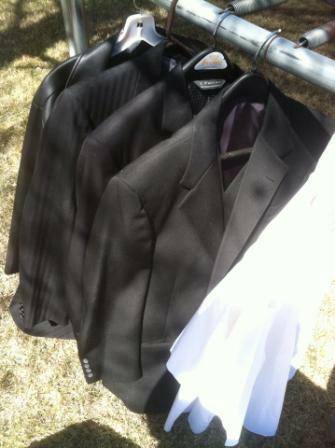 Although there are advantages to having your yard sale the same day 10 other people are having theirs, which is Saturday usually, there is also a great advantage to offering it outside the normal times. Friday evening from 5-7 pm, when everyone is getting off work, is great time to start the best yard sale ever! It gets people excited for a deal finding weekend and the turn out, in our experience, has been incredible! Have it open Friday evening AND Saturday morning to get both advantages! Another idea is a Wednesday sale from 11 am to 7 pm. Its open during lunch hour, after school, after work, and its on a Wednesday so likely you won’t have to share potential customers with any other yard sales! Avoid holiday weekends when people will be out of town. Advertise everywhere! Put it in the newspaper. Post it on your social media pages. Add it to Craigslist. Add it to local Facebook marketplaces. Put flyers up in local grocery store classified boards…let people know about it! People can’t come to the best yard sale ever if they don’t know about! 😉 Be descriptive in posts and ads letting people know what is available. It will draw them in! Take pictures of the best items and share them! We had a thread going on a local Facebook marketplace and in the comments I would post pictures of items and prices. We really got people excited to come! 4. Don’t love your stuff too much! Price it so it will go! No one likes to go to a yard sale where a shirt is $5! Seriously. I’m not going to pay $2 for a used baby onesie, no matter the brand name. Price your items to go. We just held a yard sale for my parents who have been married for 39 years. They are moving from their 9 bedroom home to a 3 bedroom apartment out of state since my Dad has been relocated for work. Rather than take a ton of time to price items individually, we had a 50 cent yard sale-where 90% of the items were only 50 cents! 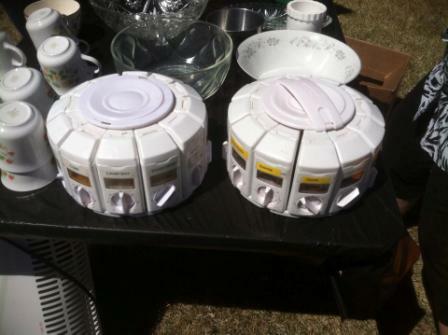 Many of these items could have sold for $5, like these nearly new spice racks, suits, prom dresses, a complete twin size comforter bed set and sheets…..these were great items, but they NEEDED them gone and I will never forget the face of the lady who asked if the bed set really was 50 cents. Her jaw almost hit the floor. 🙂 It was SO FUN to see people enjoying a good deal! I highly recommend a 50 cent yard sale if you are in the market to get rid of your stuff! We all know what ever is left over goes to the 2nd hand store and you don’t get any money out of it then! Please make sure you price items someway or another. I always leave yard sales that say make an offer and there are no prices. I don’t want to be rude and offer too low, so I just leave empty handed EVERY time! You will sell more if there are prices! We had 3 couches inside and signs at the check out saying come inside to see the couches. Not 1 person came inside the house to see them. Once we moved them outside, they sold! Have the wall hanging items together, the vases together, the wedding items together, the curling irons together, have the jewelry in a section, a section for outdoor items, books section. This way people can see all options in one area! Borrow tables, use saw horses and plywood, make tables out of anything you can think of. Items on the ground didn’t sell until we put them up on tables. As space cleared off on the tables we moved items from the ground to the tables and then those items sold! They just won’t. We had a box of dress ups (fun ones!) and on Friday night we didn’t sell one because they were all stuffed in a box. People didn’t want to take the time to look through a box and miss out on some other great deal. Saturday morning we laid them all out and 90% of them sold. Misc stuff is sure annoying to price out as the yard sale thrower, but a box that is full of random stuff priced at $5 that must go as a “box” is frustrating to a yard sale goer. I can’t count how many times I have seen 1 thing in a “$5 for whole box”, asked to buy it only, and been told no. I don’t want a box of car cleaning stuff, I just want the car cleaning wipes! Know what I mean? We set out the toys on the soft grass far from the street but in a good spot that you could see from any point in the yard. The parents were able to freely move through the yard sale without worrying that their child was going to end up in traffic and they could keep an eye on them without having to drag them through the yard sale. We’ve tried a few methods to hang clothes at a yard sale but by far, my favorite way is to use the trampoline and hang them around the metal rim part! 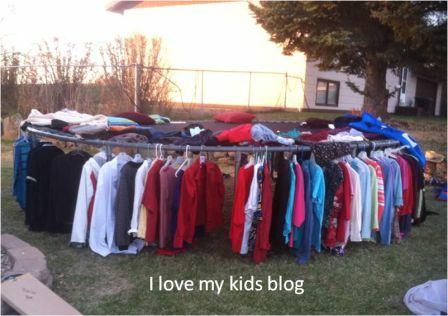 This worked GREAT for us and we heard so many compliments on how we had hung the clothes at our yard sale. 12. One man’s trash, is another man’s treasure. You just never know what someone will buy. Even if you think why on earth would anyone buy this…put it out and give it a try. 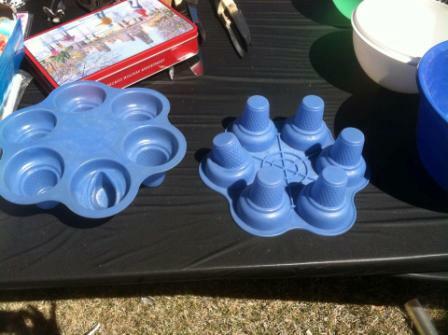 I couldn’t believe some of the items we sold at the last yard sale! This is a great box to put near the street to grab people’s attention! Write FREE on there as big as you can! Fill it with whatever you think may not sell but isn’t trash worthy. Who can say no to a treat? Not me! 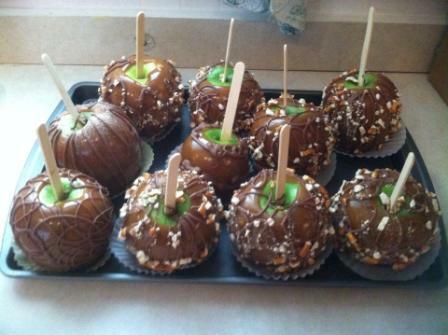 I made some homemade caramel apples and they sold out within minutes! We also had cookies and soda to sell. Don’t go too crazy and buy a ton, but having a few is always a hit! We had the quite the yard sale crew at my parents yard sale. If people have a question they are able to know who to ask. Another idea is to wear bright red lipstick. 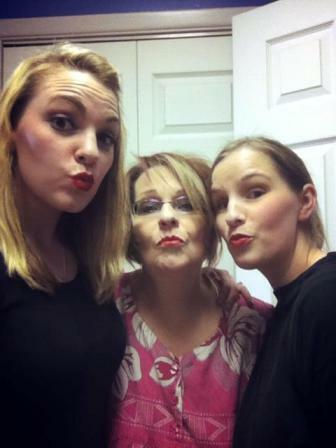 😉 Here is a picture of my youngest sister, my mom and I in our red lipstick! Plus red lipstick makes any task more fun! 17. Make it all free the last hour! In my parent’s case they needed these items gone. We sold an incredible amount of things at 50 cents and made over $1400! At 10 am we reduced the price of everything to FREE! It was so fun to tell people the prices had been reduced to free. It got cleared out fast. I advertised it on the Facebook marketplace and we had tons of people show up. They pretty much cleaned it up for us. We had very little left over to take care of. We had such an incredible yard sale that the neighbors sat on their porches just watching the mass of people come with their jaws on the ground. These 17 tips really helped us to throw the best yard sale ever! I hope that they will help you! What is your favorite yard sale tip not listed above. Let me know in a comment below! « DIY Last Minute Teacher Gift Idea that is cheap to make! My pet peeve at a garage sale is to have ot go somewhere to get change. You need to have plenty of change for $10s,$20s, $5s and small change for those items that sell so fast.